There are many actions by individuals during the Revolutionary War that are considered heroic. For example, Paul Revere and Sybil Luddington rode through the countryside to warn the colonists of the approaching redcoats, and Henry Knox and his men dragged cannon from Fort Ticonderoga in New York to Dorchester Heights in Boston in the dead of winter, forcing the British from the latter town. There are also actions we would consider less than heroic. General Charles Lee at the Battle of Monmouth is one example, and need I say more than Benedict Arnold? The stories of Joshua Huddy and Charles Asgill tell a different story, where the lines between heroism and malevolence are blurred or shifted. When it comes down to it, this is mostly a story of revenge. Joshua Huddy was born in November 8, 1735 in Salem County, New Jersey. In his younger days, he was a troublemaker, being tried for theft and assault, among other crimes. He married Mary Borden in 1764, and later moved to Colts Neck (Monmouth County), New Jersey with their two children. He was married again in 1778 to Catherine Hart, a widow who had two children. In 1779, Huddy joined the Monmouth County Militia, where he served as Captain from March to December. He led many raids against the enemy and captured a number of Loyalists. He was also accused of executing some of these Loyalists. In September 1780, an attempt was made by a party of Refugees (the term Refugee refers to Loyalists who operated independently of the British Army, but still claimed British protection) to capture Huddy at his home in Colts Neck. A party of six Refugees, under the command of an audacious enslaved man named Colonel Tye, made their way to Huddy’s home. When they arrived, Huddy was in the house with a servant girl, named Lucretia Emmons. Huddy made an attempt to defend himself against the band of Refugees. The servant girl loaded the muskets in the house and handed them to Huddy. Huddy moved from window to window, firing at the Refugees to make it appear to them that a number of men were defending the house. He was able to wound several of the Refugees, including Colonel Tye, who was shot through the wrist. The Refugees had enough and set fire to the house. Huddy, seeing his predicament, called out that he would surrender if the Refugees would help him extinguish the fire, to which they agreed. Angered that one man had caused so much trouble, the Refugees took Huddy off as a captive, closely followed by the neighboring militia, who had been roused by the commotion. The Refugees, with Huddy, reached Black Point (between the Shrewsbury and Navesink Rivers on the Rumson peninsula) slightly ahead of the militia, and embarked on boats which they had hidden earlier. When the militiamen reached the riverbank, they fired upon the Refugee boats. In the ensuing confusion, Huddy escaped, jumping off the boat. As he swam for the shore, he was shot from the riverbank in the thigh. Huddy raised his hand and shouted: ‘I am Huddy! I am Huddy!’ by which his compatriots brought him safely to shore. About midnight of the 23rd this party landed near the mouth of Toms River (probably near present-day Ortley Beach). Garret Irons, who was on patrol, ran seven miles to the Blockhouse to alert the twenty-five or twenty-six defenders. By daylight of the 24th, the Loyalist force reached the Blockhouse. Lieutenant Blanchard demanded the surrender of the Blockhouse and those inside, which was refused. The Loyalist force then stormed the Blockhouse. 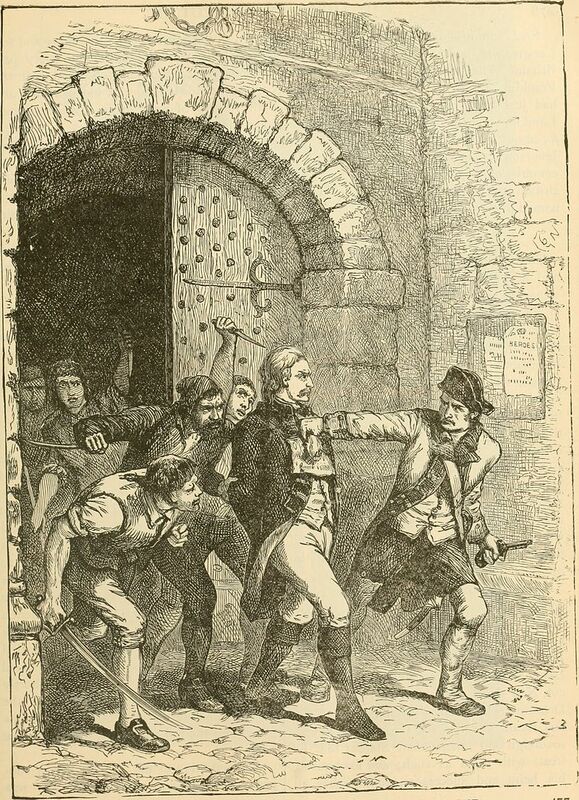 In the ensuing action, the Patriots had nine men killed, and twelve captured; the rest made their escape. Rivington’s Royal Gazette reported that the Rebels had killed a Major of the militia, two Captains, and one Lieutenant. On the Loyalist side, Rivington’s reported two killed – Lieutenant Iredell, of the armed boatmen, and Lieutenant Inslee, of the Loyalists – and Lieutenant Roberts and five others wounded. The Loyalists burned all of the dozen or so houses in the village except for two. They also burned the Blockhouse, the tavern, the blacksmith shop, and the salt warehouses together with a saw-mill and grist-mill. Huddy had escaped into the countryside, but was found later that day with two other Patriots hiding in a nearby mill. Huddy and the two other Patriots, Daniel Randolph and Jacob Fleming, were taken prisoner aboard the Arrogant, and brought back to New York. Huddy was housed in the infamous Sugar House Prison in New York until April 8, 1782. At that time, Huddy, Randolph, and Fleming were removed to a sloop (a small sailing boat) and placed in irons. On the 9th, they were transferred to the British man-of-war Britannia, under a Captain Morris. Huddy’s body was left hanging on the shore until the afternoon, when it was taken to the house of Captain James Greene of Freehold. Huddy was buried at the Old Tennent Church with military honors. After news of Joshua Huddy’s murderous execution reached General George Washington, Washington demanded that the alleged murderer, Captain Lippencott, be given up to the Patriots to face execution. Sir Henry Clinton, who did not approve of the hanging of Huddy, had Lippencott arrested, and ordered him to be tried for murder. General Washington wrote an unkind letter to Clinton expressing the wishes of himself and the people to have Lippencott turned over to them. Washington’s letter included depositions proving that Huddy was not concerned in the murder of Phillip White. Huddy had confessed, however, that he had killed other Loyalists. Clinton was not moved. Lippencott was tried by court-martial. He argued that he was not subject to court-martial, but instead should be tried by common law, in which case, he could not be tried in New York for a crime committed in New Jersey. Lippencott’s objections were overruled, but as it appeared that he acted under orders of the Board of Associated Loyalists of New York, of which he was bound to obey, he was acquitted. The people of Monmouth County, New Jersey, immediately voiced their displeasure to General Washington. On May 4, 1782, Washington directed Brigadier-General James Hogan to designate by lot a British Captain from among the prisoners who had unconditionally surrendered. Hogan could find no such officer, and Washington asked him to find men made prisoners by convention or capitulation. The British Captains who had surrendered at Yorktown and were quartered in Lancaster, Pennsylvania fell under Hogan’s command. The aide-de-camp and the commissary to the Brigadier General left the room, and in a short time returned with a drum-boy. The aide-de-camp and the commissary each had a hat in their hand. It was explained to the British prisoners that in one hat were written, on separate pieces of paper, the names of the thirteen captains; in the other hat were also thirteen pieces of paper, one being marked with the word ‘unfortunate,’ while the other 12 pieces were blank. The drum-boy drew a name, while one of the other men drew the other paper. The paper marked ‘unfortunate’ was drawn on the eleventh pick, along with the name of Captain Charles Asgill, who was immediately turned over to a dragoon officer. On May 27th, Asgill, with Major Gordon, left Lancaster, escorted by a party of dragoons. In a few days time, they arrived in Philadelphia. From there, Asgill was sent to Chatham, New Jersey, and placed under the charge of Colonel Elias Dayton. On 25 August 25th, he was paroled to Morristown, New Jersey. During this time, Major Gordon appealed to the French Minister in Philadelphia, the Comte de Rochambeau and numerous influential men in the Colonies. Asgill’s mother, Sarah, wrote to the French Court, asking that they please save her son’s life. The Comte de Vergennes (the French Foreign Minister at the time) was ordered by King Louis XVI to communicate with General Washington that it was his wish that Asgill be spared, under the 14th Article of Capitulation, safeguarding prisoners of war. For about seven months, Asgill’s fate remained in the air. In December, 1782, Congress agreed to allow Asgill to be released to England. He escaped the fate of Joshua Huddy. He was sent to New York, and embarked for England on the first oppurtunity, ending the new nation’s first international crisis. Titus was enslaved by John Corlies of Shrewsbury, Monmouth County, New Jersey. He escaped in November 1775, and changed his name to Tye. Tye fought in the Battle of Monmouth, June 28, 1778, and afterwards launched raids, mostly in Monmouth County, against Patriots. Tye’s wound later caused lockjaw, which killed him. Kobbé, Gustav, The Jersey Coast and Pines. Baltimore: Gateway Press, Inc., 1970, p. 24. A blockhouse is a small fort, one building, usually in an isolated position. The one Huddy was defending protected the village of Toms River and the salt works near by. “The post into which the rebels had thrown themselves was six or seven feet high, made with large logs, with loop-holes between and a number of brass swivels on the top, which was entirely open, nor was there any way of entering but by climbing over. They had, besides swivels, muskets with bayonets and long pikes for their defence.” The date of his arrival is cited from The War at the Shore 2007: Commemorating the 225th Anniversary of the Revolutionary War in Ocean County 1776 – 1783. [pamphlet] Ocean County Board of Chosen Freeholders, 2007. The description of the Blockhouse is from Salter, Edwain. A History of Monmouth and Ocean Counties. Bayone, NJ: E. Gardner & Son, 1890, p. 205. The War at the Shore, 2007. Salter, 206. Of those casualties, the following have so far been identified by the author: Major John Cook, killed; Captain Ephraim Jenkins, killed; Daniel Randolph, captured; Jacob Fleming, captured; Moses Robbins, wounded. George, John and Joseph Parker were all with Huddy at the Blockhouse; their fate is thus far unknown. New York City contained many sugar houses. During the British occupation, the sugar houses were used as prisons. Many men died from the squalid conditions in these prisons, as well as the prison ships stationed off of New York City. The Sugar House Prison was the most infamous of all the prisons in New York City. Randolph and Fleming were soon exchanged for two Tories: Captain Clayton Tilton and Aaron White. Phillip White was a Tory who met his death attempting to escape the Patriots about a week after Huddy’s capture. Lippencott claimed White was murdered by the Patriots, and in return, Huddy would be killed. The quote was taken from Salter, 185-186. Memoir of General Graham with notices of the campaigns in which he was engaged from 1779 to 1801. ed. by his son Col. James J. Graham. R&R Clark, Edinburgh, 1862, p. 84. Graham, 82. The names of these men are as follows: Eld, Perryn, Charles Asgill, Ludlow, Greville, Lawford Mills, Saumarez (later Sir Thomas), Ingram, Samuel Graham, Barclay, Arbuthnot, Hathorn and Whitelocke. Graham, 91, 96. Asgill traveled to France to personally thank King Louis XVI and Queen Marie Antoinette. A decade later, he fought under the Duke of York in Europe, and later became a Major General. Asgill died in London July 23, 1823 and was buried in the vault at St. James’s Church Piccadilly.